Whenever you do something out of your comfort zone, especially in relationships, it can be very difficult to deal with the after effects. 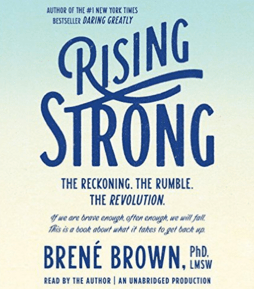 As I mentioned a few weeks ago, I have been reading “Rising Strong” by Brene Brown, PhD, which deals with this very topic. I’ve always been inspired by her writing, but this book is by far her most important work! It’s summarizes the devastation that can take place after we take a risk and try something new unsuccessfully. When we can find ourselves at the bottom of a pit of depression–or, even worse, in middle of an arena, exposed and vulnerable, with our pride and our guts all over the place. We never expect to find ourselves in a place like that, especially when we have bravely ventured into vulnerability and authenticity…and not been met with the same. But the reality is it happens to everyone. If we are bold enough to be real, we’re going to get mud on our face. It’s risky business. All this to say, you should check out this book…it is well worth the read! This entry was posted in communication, Counseling, Couples, motivation and tagged authenticity, communication, conflict, relationships, vulnerability. Bookmark the permalink.